Noble Bodies is Bryce Taylor (guitar/vox/drums), Elaine Bradley (drums/vox/guitar), and Chris Bennett (bass). They started a band in the fall of 2004 under the name Another Statistic. Bryce met Elaine in Germany while they were serving LDS church missions in 2003. Both had been in bands before, and Bryce got it in his mind that he and Elaine needed to be in a band together when they got home. After several months of phone calls, Elaine finally moved from Chicago to Provo to attend BYU. Bryce and Elaine got together and played guitars, which wasn’t all that great. Feeling bad that it hadn’t worked out, Elaine offered to play the drums while Bryce played guitar. THAT was cool. After a few weeks, they had put together some songs in her basement, which made it clear that they needed a bassist. Chris and Bryce were friends from high school. After trying Chris out, Elaine and Bryce knew he'd be a perfect fit for the music they were writing. Noble Bodies are all self-taught musicians, which they believe helps them in the originality of the music they write…or at least that’s what they tell themselves. 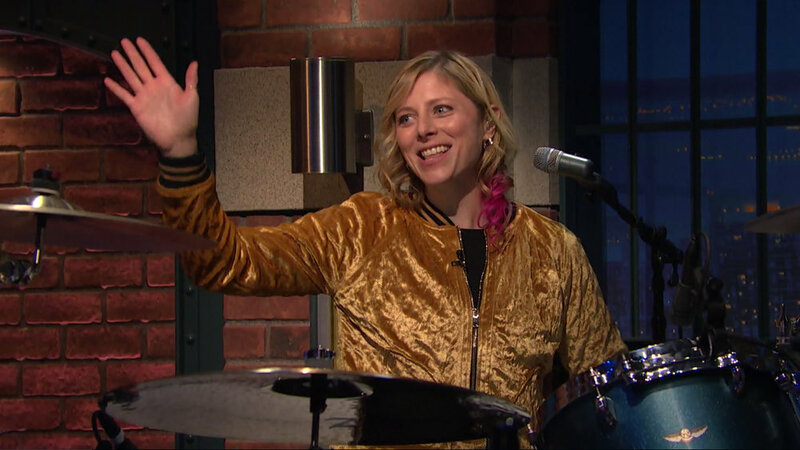 In the Fall of 2016, Elaine was asked to sit in with Late Night with Seth Meyers’ 8G band for a week. Let it be known that Elaine hates practicing the drums by herself. The Trees were taking a much deserved break, so she called up Bryce to come play with her so it wouldn’t be so arduous to brush up before the show taping. After the first day, Bryce called Chris…all of the sudden, new music was being written and grand ideas were starting to form. All three of them realized that they just love the heck out of the music they create together, and by golly, they needed to do something about it…finally. Noble Bodies released their first single under the name Noble Bodies called "What A World" that was released September 12, 2017. On November 27, 2017 Noble Bodies released their EP “It’s Ok It’s Hell”. Noble Bodies hit the road in April-May 2018 on their "Come See Us" Tour. They are currently recording new material and released another single called "Take Me Down" in May 2018. They hope to have the album ready by the end of 2018 to early 2019. Bryce, Elaine, and Chris want you to love Noble Bodies, at least almost as much as they do. Noble bodies was featured in the local newspaper called The Daily Herald August 4, 2018. They performed at the annual Provo Rooftop Concert Series in Provo sponsored by Provo, UT. They played with another band with a battle of the band style with no real winner and all for fun. Although not a true battle, they paper reported the other band "seemed the looser of the two contenders,.....Noble Bodies, as a trio, presented the more polished and serious set." Noble Bodies was featured in IDOBI Radio May 14, 2018 featuring their newest single "Take Me Down". They heading was called "Noble Bodies Brings Down The House with "Take Me Down". Seth Meyers gave a shout out to Noble Bodies about their premiere of "What A World" on the September 12, 2017 episode of the Late Night with Seth Meyers. Noble Bodies Release Video for "Take Me Down"